Kiala Givehand here with my first post as a StencilGirl® Columnist. My hope is that this year, as a columnist focused on Book Art and Bookbinding related topics, I can bring you lots of fun ways to start, continue, and complete those many projects you have sitting around your studio/art table (or the ones floating around in your heart). BOOK ART: Art that incorporates the form, and/or function of a book as inspiration or as a way to deliver content. BOOKBINDING: The act of binding papers together to create a book (or book-like) structure that can be blank or filled with words and images. 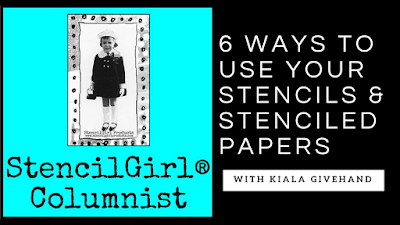 But for now, just take it easy and see what strikes your fancy as I share my love for paper, stencils, and bookbinding. I welcome conversation, your questions, and tons of alternative ideas. I love when I share something you've done or hear how you might take my idea/suggestion and expand on it. Now that you've seen my favorite 6 ways to give my projects an intentional look, I'm curious, which was your favorite? Which one are you going to try this week? Stay tuned for more tips, techniques, and talk about Book Art.